The screen is pretty simply. We have a button for activating the Bluetooth connection to the Arduino and a button to control the LED. Other elements include the Bluetooth Client, a notifier and a clock/timer. The timer (Clock1) is used to check for incoming data and is set to trigger every 100ms. This is 10 times a second and more than fast enough for this example. TimerEnabled is set to false (not ticked) which means the timer is turned off when the app starts. We turn the timer on in the blocks when the user makes a Bluetooth connection. You will notice that all the commands are the same length. This makes things easier to code on the Arduino. Using a command type (the L for LED) allows us to add extra commands later, for example, S for slider, without the need to make big changes to the app. 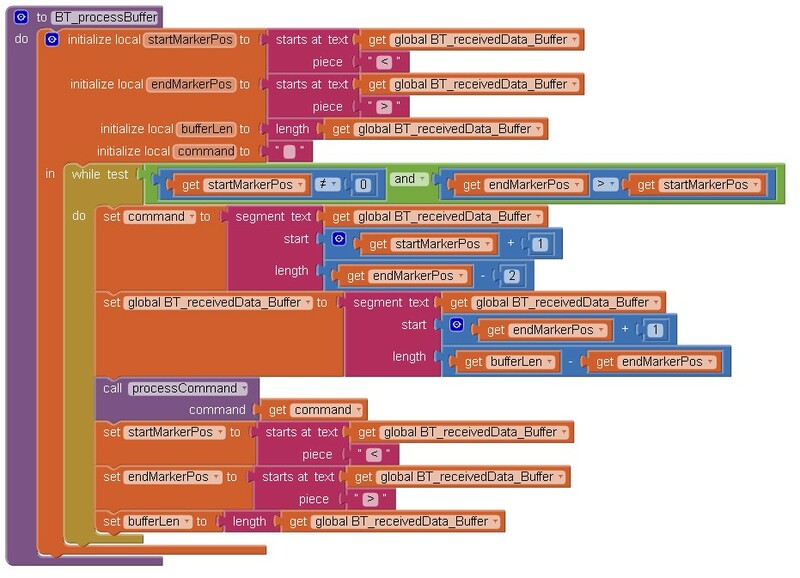 Off course we could use the same commands as used when sending data from the app to the Arduino but the extra commas allow us to easily split the command in to separate parts. Bluetooth communication (as with any serial communication) is not 100% bullet proof and there are things you need to watch out for. The App Inventor 2 aia file can be downloaded at the bottom of the post. When the app first runs the screen is displayed and then it waits for user input. Before the LEDs can be controlled the user needs to connect to the Arduino. They do this by clicking the Bluetooth button and then selecting the Bluetooth module connected to the Arduino. If the user clicks one of the LED buttons before a connection is made an error message is displayed. 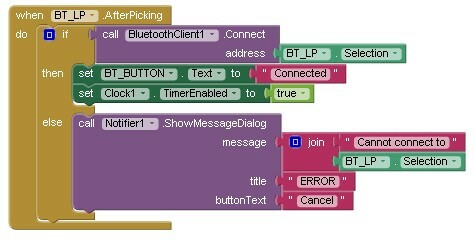 When the Bluetooth button is clicked the BT_BUTTON.Click block is executed. – the ListPicker is activated. If Bluetooth is not turned on an error message is displayed. If there is already an active connection the user is asked if they would like to close it. If there are no paired devices an error message is displayed. I use a list for the pair devices because at the time I first wrote this I could not work out how to tell how many paired devices there were from the ListPicker alone. After the user selects one of the paired devices from the list picker the BT_LP.AfterPicking block is called. It is here the app tries to connect to the Arduino. If the connection is successful it changes the Bluetooth button text to Connected and starts the timer. If the connection attempt fails an error message is displayed. The timer is used to check for incoming data. 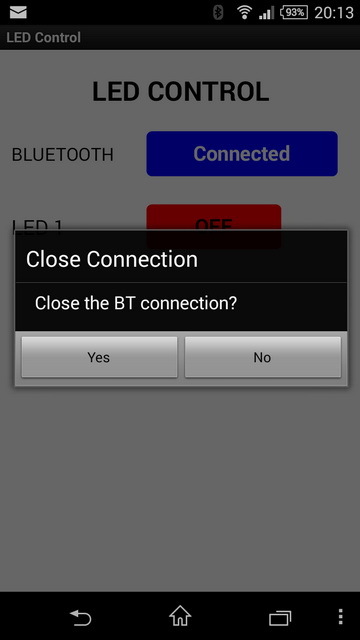 If the user clicks the Bluetooth button while there is an active connection they are asked if they would like to close the connection. After the user selects one of the notifier options the Notifier1.AfterChoosing block is called. If the user selected “Yes” the connection is closed. 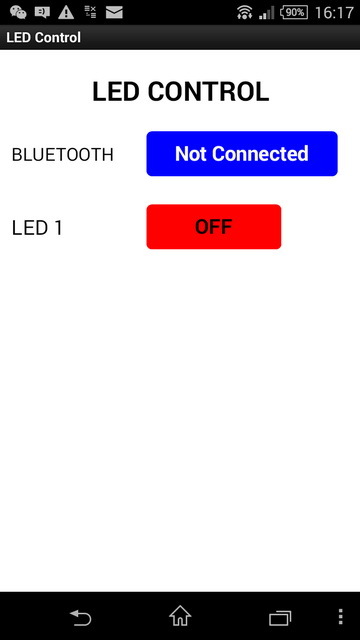 After Bluetooth has been connected and the timer has been started the app keeps checking for incoming data and also for the LED button being pressed. 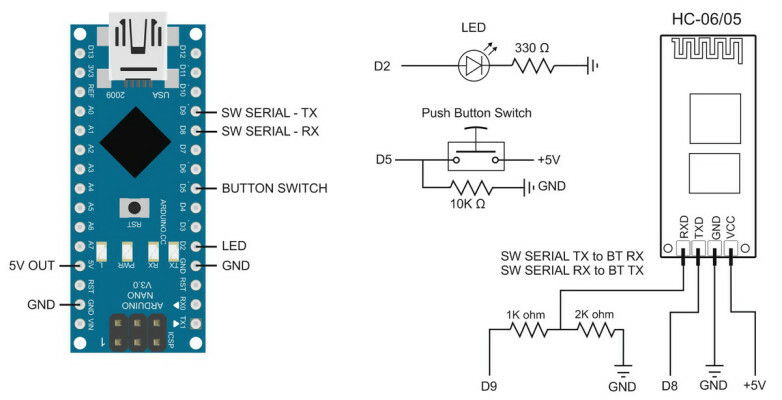 When the LED button is clicked the LED1_BUTTON_btn.Click function is called. – sends a <L11> data command to the Arduino. – a <L10> data command is sent to the Arduino. If Bluetooth is not connected an error message is displayed. The Arduino sketch checks for incoming data every iteration of the main loop. In AI2 we do not have a main loop and we need to use a timer. Every time the timer fires a special function is called. When the timer fires the app takes a note of where it is and what it is doing, it then jumps to the timer function, performs what ever code is in the timer function and then jumps back to the previous position and carries on. The first thing the function does is too stop the timer. 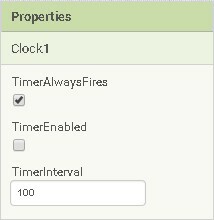 This stops the timer calling the timer function before it has finished. Next the BT_getNewData function is called. 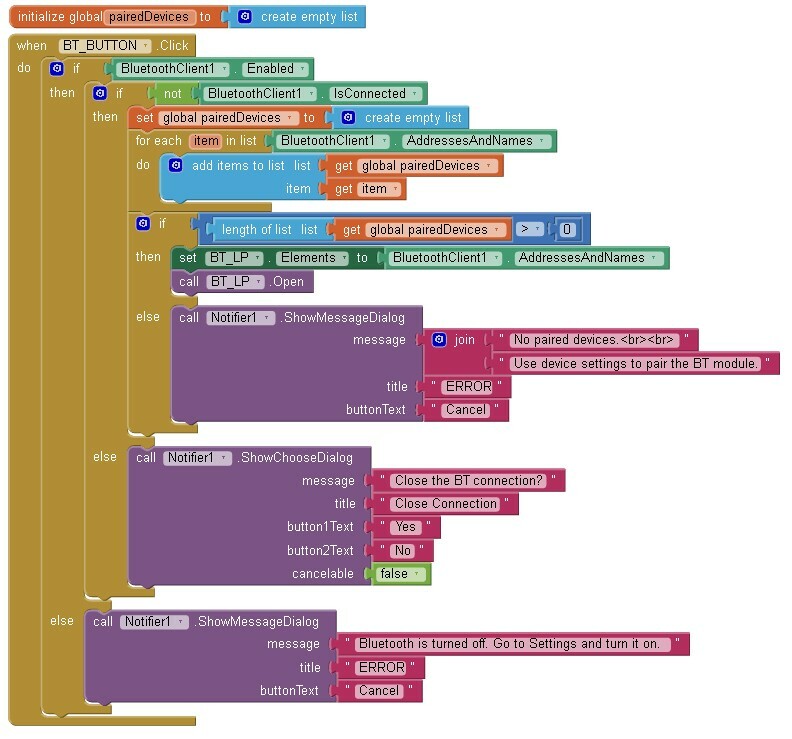 Here the app checks for new data and if there is any it adds it to the global variable BT_receivedData_Buffer. There are no guarantees that we will receive a complete command at one time so we need to collect the incoming data and store it in a buffer. We then test the buffer to see if it contains a command. Next up is the BT_trimToStartMarker function. This trims the buffer so that the first character is a start of data marker (the “<” character). This is not really required for this example but it helps when there are more commands or the data is being sent more quickly. After this we check for commands by calling the BT_processBuffer function. Here we check that we have both the start marker and the end marker and that they are the right way-a-round (not really required since we have trimmed the data using the BT_trimToStartMarker function). The actual command is then extracted and sent to the processCommand function. Here the command is separated in to individual elements using the split block. Here we are using the commas as the dividing points. In this example the way we are separating the command is not really required since we have fixed length commands but should we add new commands of a different length later it will come in very useful. The split command puts the parts in to a list (the AI2 version of an array). 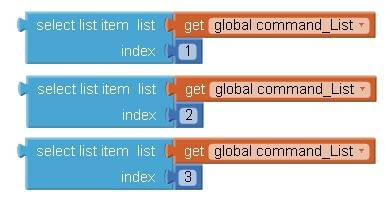 The 3 parts are accessed by using the select list item block. 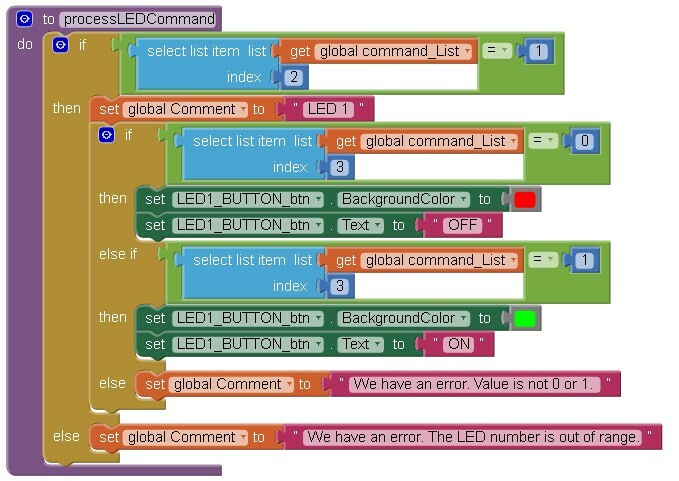 The processCommand function checks to see if the first property is an “L” for LED and if it is calls the processLEDCommand function. Again this is not really required for this simple example but by doing it this way we can add extra commands easily by adding an extra condition in the processCommand function and then adding a new function to handle the new command. If the LED has been turned off the LED button is changed accordingly. The function then checks to see if the value at uindex 3 is a 1 and if it is sets the LED button is set to show the LED is on. If the data at index 3 is not a 0 and also not a 1 then we have an error. In the example no action is taken but you could add a warning message or display the incorrect command some way. The circuit compromises a LED on D2 and a button switch on D5. Corrected the diagram. I had the Arduino RX and TX pins swapped. Note: The circuit shows a 330 ohm resistor on the LED where as the breadboard shows a 220 ohm resistor. The 220 ohm resistor was what I had on hand…. 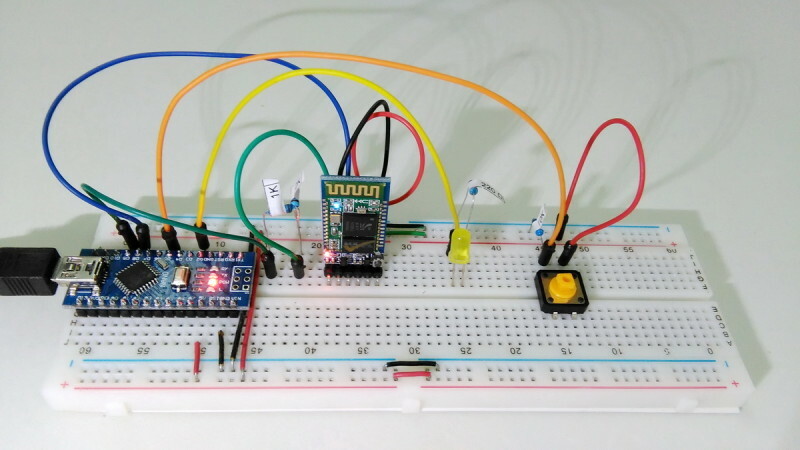 The Setup() function initialises the pins for the LED and the button switch, opens the serial channel for debugging messages and opens AltSoftSerial to the Bluetooth module. – Calls the checkSwitch function which checks to see if the button switch has been pressed (closed). – Calls recvWithStartEndMarkers() to see if there is any new data received from the Bluetooth connection. – If new data has been received calls processCommand() which checks to see if the data is a command. 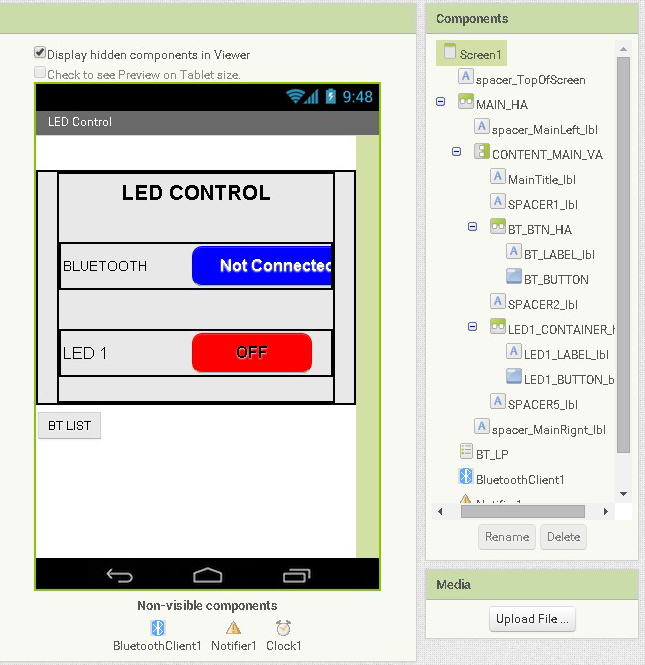 The checkSwitch function checks to see if the button switch has been pressed and if it has toggles the state of the LED and sends the relevant command to the Android app. The processCommand function checks the received data to see if it is a command, if it is it changes the LED and LED1_State accordingly. Download the App Inventor 2 aia file and the Arduino sketch. 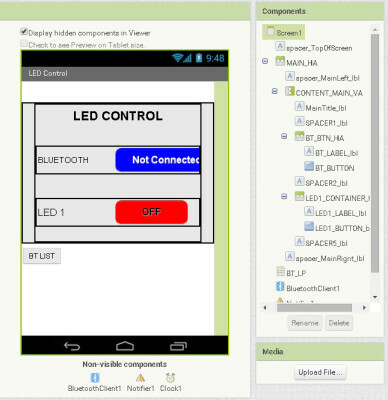 This entry was posted in Android, app inventor, Arduino, Bluetooth and tagged App Inventor, arduino, Bluetooth by Martyn. Bookmark the permalink. Check the commands you are sending to the app. There isn’t a lot of error checking on the data the app receives. It looks like this error is caused by the command segment text command. Do you have a programming session online?? I have corrected the diagram. Thanks for pointing out the mistake. Sorry, no programming guides, but there are many online. Can I change the push button to capasitive touch sensor? Yes. You would need to change the switch pin check part of the sketch. Google arduino capacitive touch sensor will get you lots of hits. your code works without change anything, thanks so much. i wont to add rfid reader. Sir I just need to take input from uC and then change label colour according to input. What changes do I need to make in your blocks as minimum as possible. As after reading your post I can sense you have used many blocks for further use or may be for some extra precautions. I have problem and I wish I can solve it , I am using Arduino micro and I am trying to do the above, everything went well except for the Bluetooth it did not work I installed it on my phone the app but whenever I connect to hc-06 and click on it does not trun it on the led , the switch it works. I did the voltage divider but I did not work. is there and thing I can do so that I know where is the problem? the BT module may not be the exact same one you have but the process should be the same.